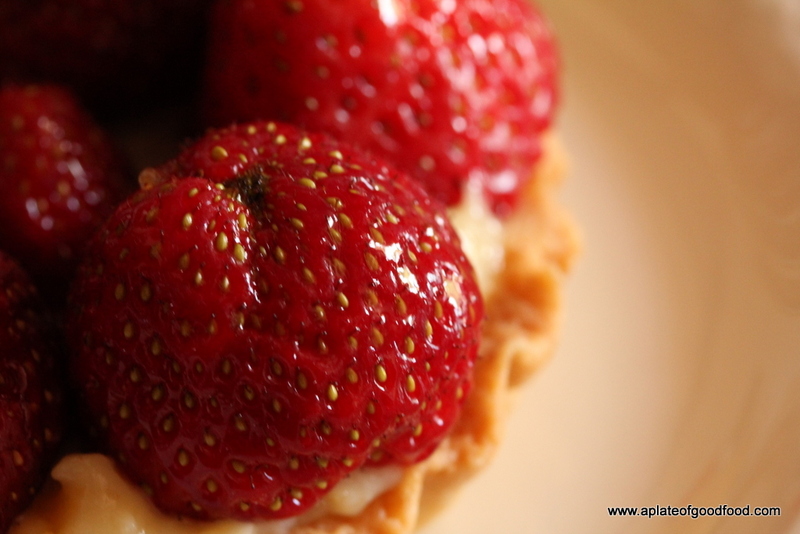 The only changes I made apart from using only strawberries, was to scale down the measurements to yield 6 little tarts. In hindsight, I think I had just enough pastry for 4 (as evidenced by the shrunk pastry cases in the pictures below) and that’s how many I shall make the next time round. First make the pastry. Sift the flour and icing sugar together in a bowl. Add the butter in cubes and use your fingers to rub it in until the mixture resembles breadcrumbs. You may also use a pastry cutter to do this. Add the egg yolk and bring the dough together, adding a few splashes of water if required. Wrap in cling film and leave in the fridge for at least 10-15 minutes. Preheat the oven to 180C (conventional). Take the pastry out of the fridge and remove cling film. Roll the pastry out on a floured surface to an even thickness of around 5mm. Cut circles out of the pastry making sure that they’re slightly bigger than the tart cases or you may use the tart case itself to cut 4 circles for 4 tart cases. 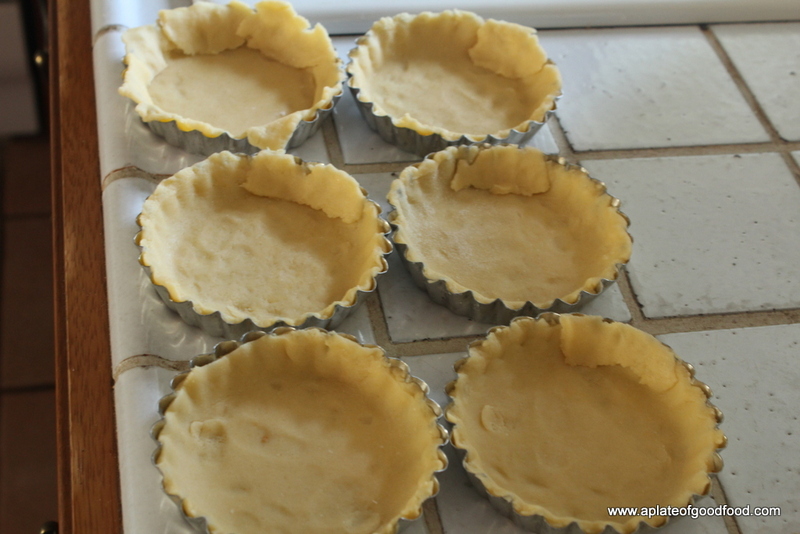 Line the cases with the pastry and press it into the tins using your fingers. Make sure you have enough pastry to work with here otherwise the baked pastry shells could turn out be much smaller than you expected. Prick the base of the pastry with a fork, line the tin with foil and fill it with ceramic beans, uncooked beans or rice. Do this with all 4 cases. Place the cases in the oven and bake for about 15 minutes. Remove the cases from the oven, remove the foil and beans/rice filling and place the cases back into the oven. Bake for a further 10 minutes so it cooks all the way through. 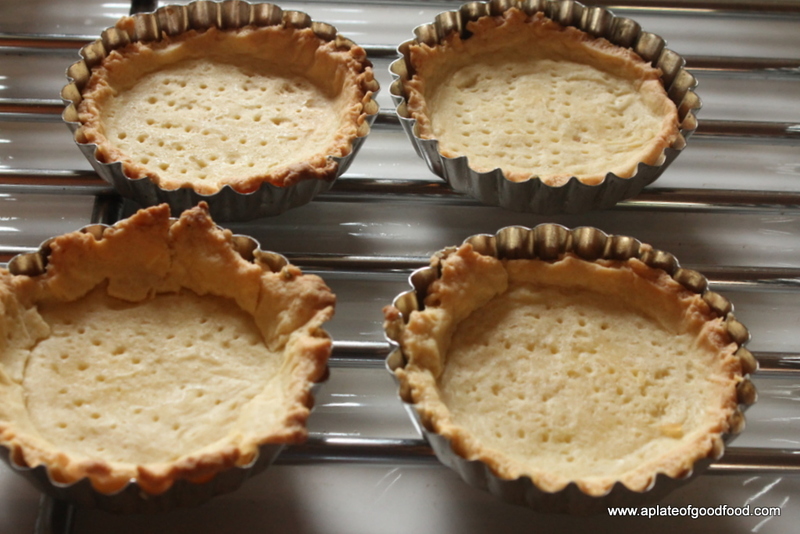 Once ready, remove the tins from the oven and let them cool on a wire rack before turning out the pastry cases. 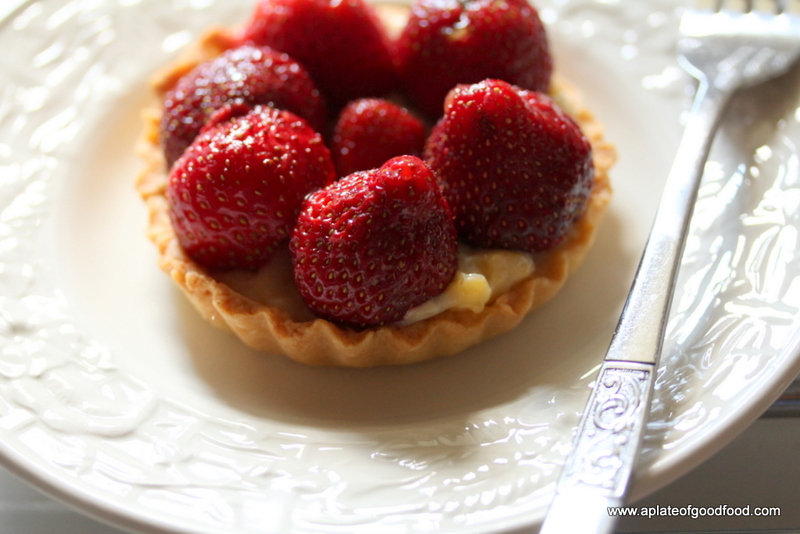 While the pastry cases are baking, you can make the creme patissiere. Whisk the egg yolks, flour and sugar in a bowl. Heat the milk in a large pan until just boiling. Pour the milk into the bowl with the egg/flour mixture, whisk to combine and pour it back into the pan. Cook on a medium heat stirring consistently. Once the mixture thickens, remove pan from heat and transfer to a large bowl so it cools down. Sprinkle some icing sugar on the surface to prevent a skin from forming. 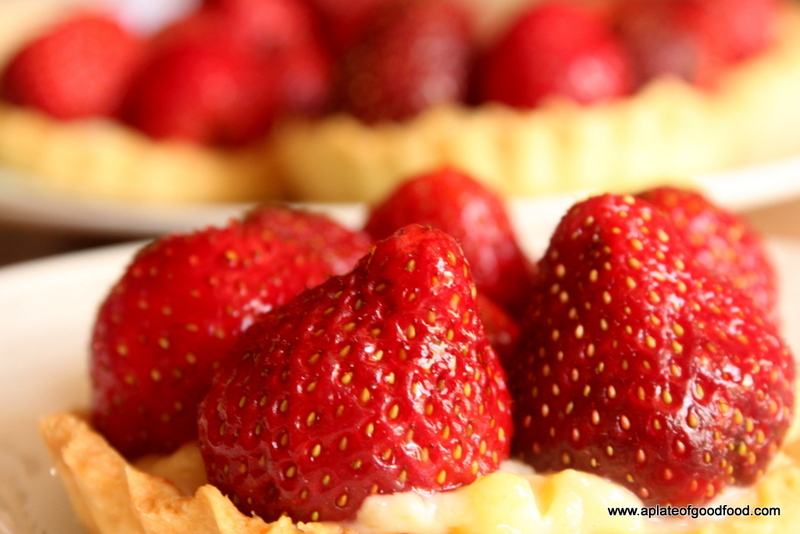 If using jam to finish the tarts, place it in a small saucepan with 2tbsp water and warm it on a low heat and then leave to cool. 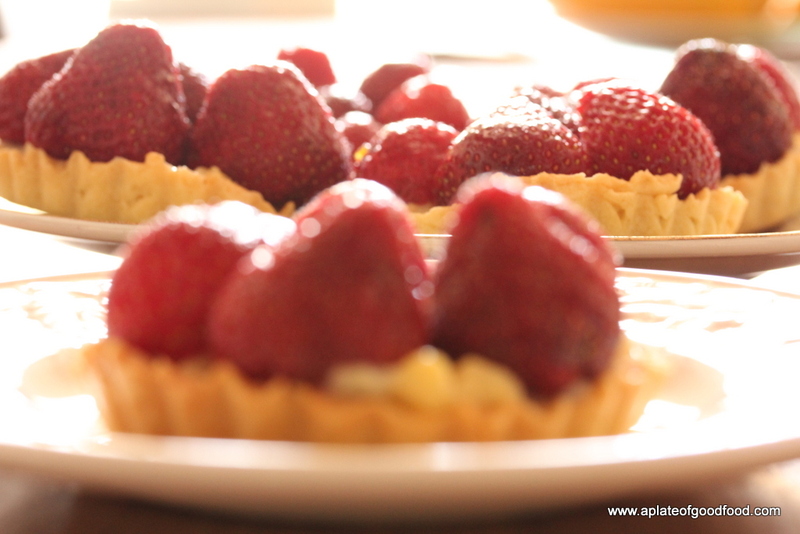 To assemble the tarts, fill each pastry case with enough creme patissiere, top it off with fruit of your choice. Brush with jam if using and serve. 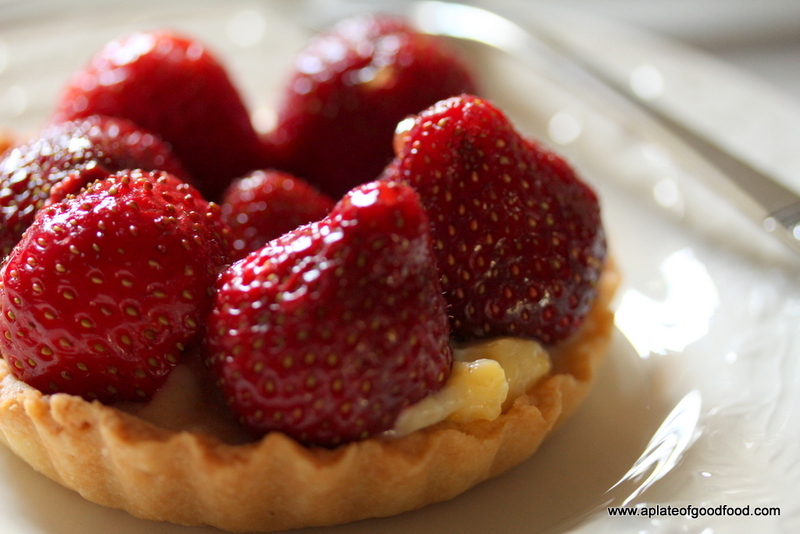 A filling dessert to enjoy at the end of a light meal or just on its own with a cup of coffee. Enjoy! I love how you’ve put up such honest photos of the tarts with the base all crumbly. Don’t get me wrong, it looks delectable, but they do tend to fall apart when you’re fitting them in the tin and it’s incredibly cool that you didn’t just photoshop them. Images of food in a lot of blogs look unreal and this just hits the mark of gorgeous, candid food photos devoid of airbrushing. P.S. – Also, if you wouldn’t mind imparting a little advice, I can’t wait to try your apricot almond cake recipe (I am bowled over by the photos), but whenever I try a non-upside-down cake recipe that involves fresh fruit, the moisture from the fruit tends to upset the consistency of the batter. Do you know of any way to deal with that? About using fruit in non-upside-down cakes, I always try using firm ripe fruit especially when it comes to stone fruit. Also, if you ever use frozen fruit, that can cause more moisture to be released into the cake as well. Just to add to that…If I feel the fruit is going to add to the moisture, I’d also cut down the amount of liquid called for in the recipe. And thank you for the tips 🙂 usually I use fresh fruit and not frozen ones, so I’ll try cutting down on the moisture content the next time I bake with fruit. Please do! And let me know how it goes 🙂 Good luck!